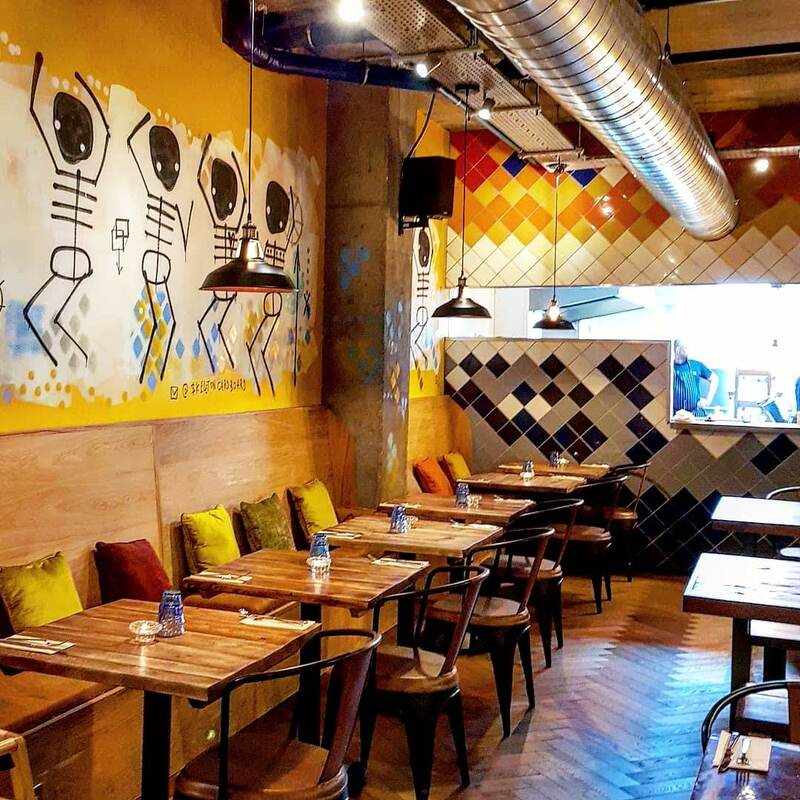 Pepitos is a brand new spot in Hackney. 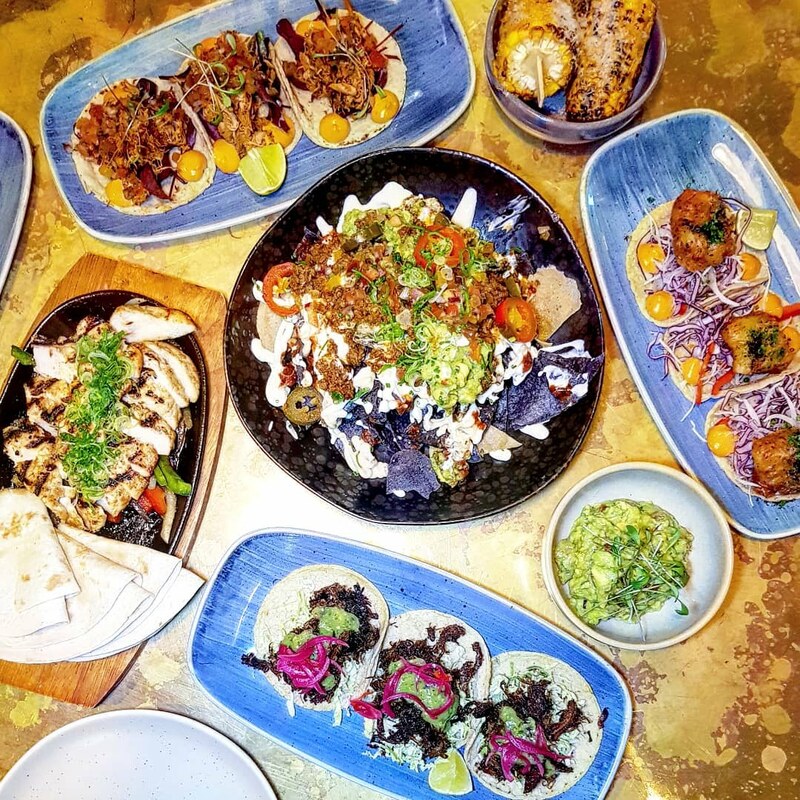 A Mexican kitchen, that is constantly evolving its menu with fusion flavours, merging popular dishes with traditional mexican tastes. 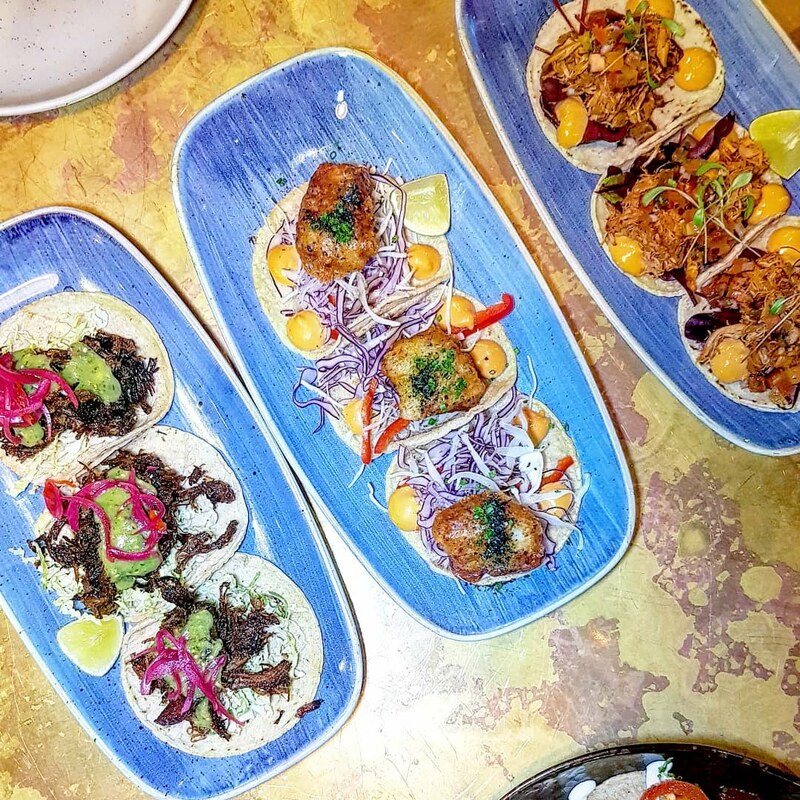 Think Mexican poke and cactus and kimchi tacos. Intriguing right?! It’s worth the trip! Inside Pepitos, it’s got that classic south American canteen/diner feel. Lots of woods, bright colours and tribal artwork. It’s pretty cool, and fits right into the hackney scene. Service is pretty great too which makes for a really good experience. The menu as it stood when we visited, featured all the Mexican classics – nachos, tacos and enchiladas – as well as a couple of fusion dishes. They are constantly developing the menu too – the manager and head chef are keen to offer something new and exciting to the scene, and develop some fab new dishes. The Chicken fajitas arrived in a sizzling hot dish layered with onions, peppers and spices ready to wrap. Tatemada, Pico de Gallo, Sour Cream and fresh warm tortillas came alongside too. They went down well with the table, but I didn’t think they quite matched the quality of the pork carnitas enchiladas. These, in a tomato and peppery red sauce, topped with dollops of guacamole and sour cream, were delicious. 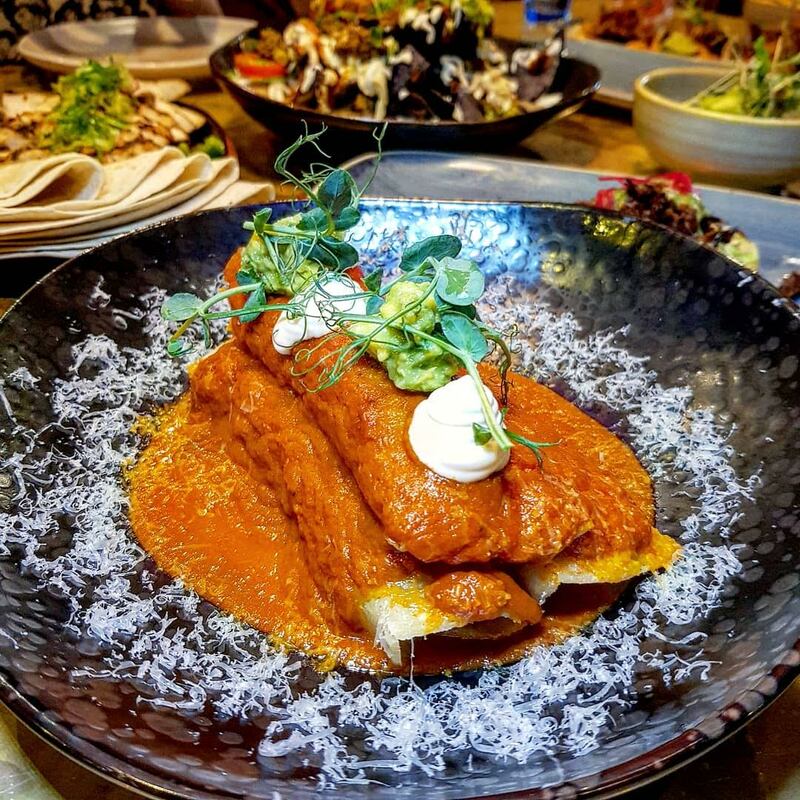 Lots of flavour and a great filling to wrap and sauce ratio – just what you want with enchiladas. The Pocket Poke Bowl is one of the newer options, and one of the experiments into fusion flavours. 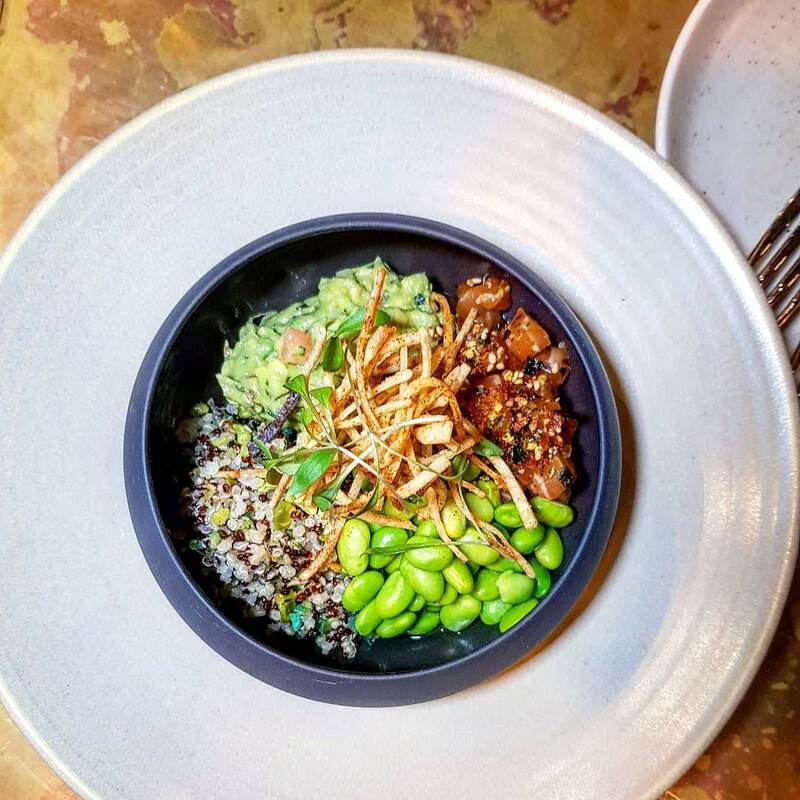 Featuring quinoa cooked in coconut oil mixed with sriracha, alongside wasabi peas, edamame beans, guacamole and raw salmon bathed in a tamarind and soy sauce, it’s one bowl of delicious flavours and textures. There’s also toasted nacho strands atop. 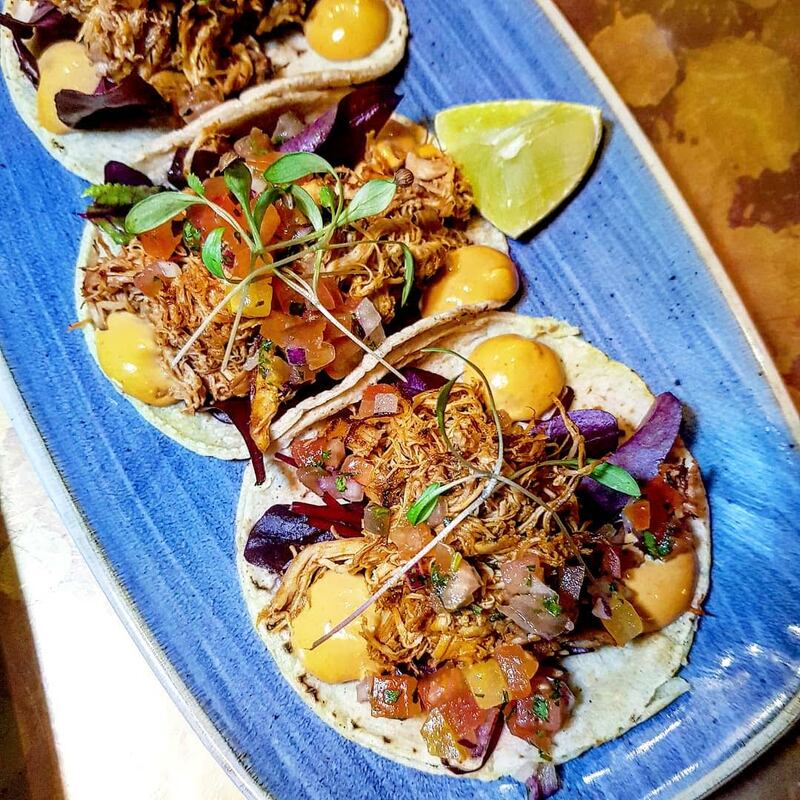 I don’t think the Mexican flavours come through as much as they could, but it’s great to have something a little different on a Mexican menu. 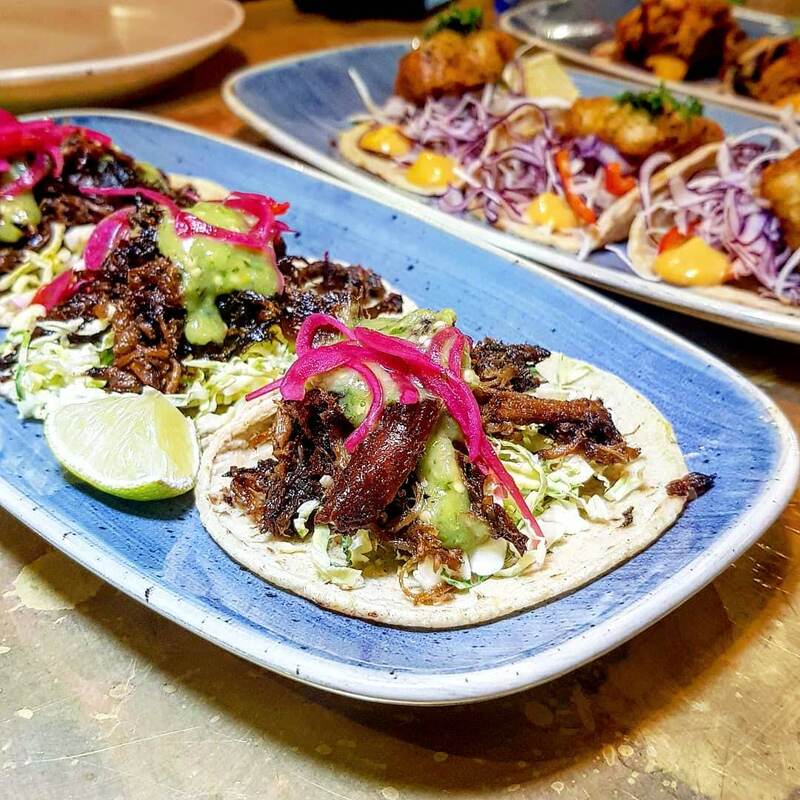 We tried ALL of the tacos, and can say you can’t go wrong with any decision. They come as a portion of three soft corn tortillas with plenty atop. The Chicken Tinga on Bull’s Blood salad with Pico de Gallo, went down a treat, but the Pork Carnitas on Savoy cabbage topped with Xni-Pec came out as our fave meaty option. Both very tasty! The meat was great – juicy and slow cooked. I do love a fish taco, and the Fried Battered Cod with Chipotle Aioli and Ao-nori did not disappoint. The fish was lightly battered, and went beautifully with the aioli and ao-nori. Some fab fresh textures and flavours. The Vegan Kimchi Tacos were a little different. 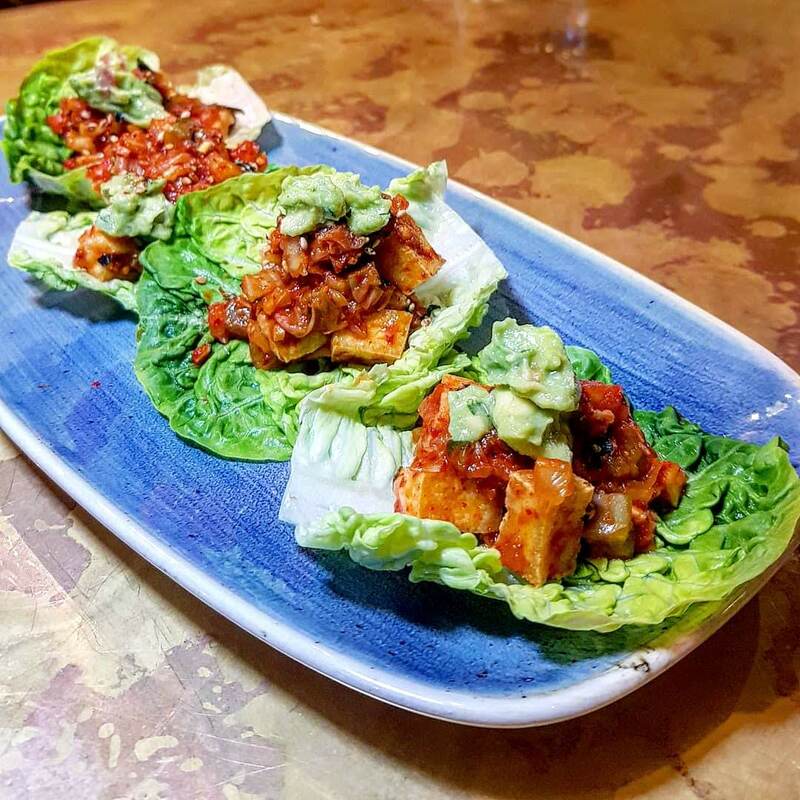 Served on baby gem leaves instead of tacos, they’re topped with fried tofu, kimchi with galangal, cactus and guacamole. The kimchi flavour shines through making them a tad pickled/sour. The tofu had a fab texture, and altogether they were pretty tasty. Although they’re a fab alternative, I don’t think I’d necessarily opt for these above the fish tacos, unfortunately. The Mexican corn on the cob is another must. It’s cooked superbly and coated in sauce and finely grated cheese. 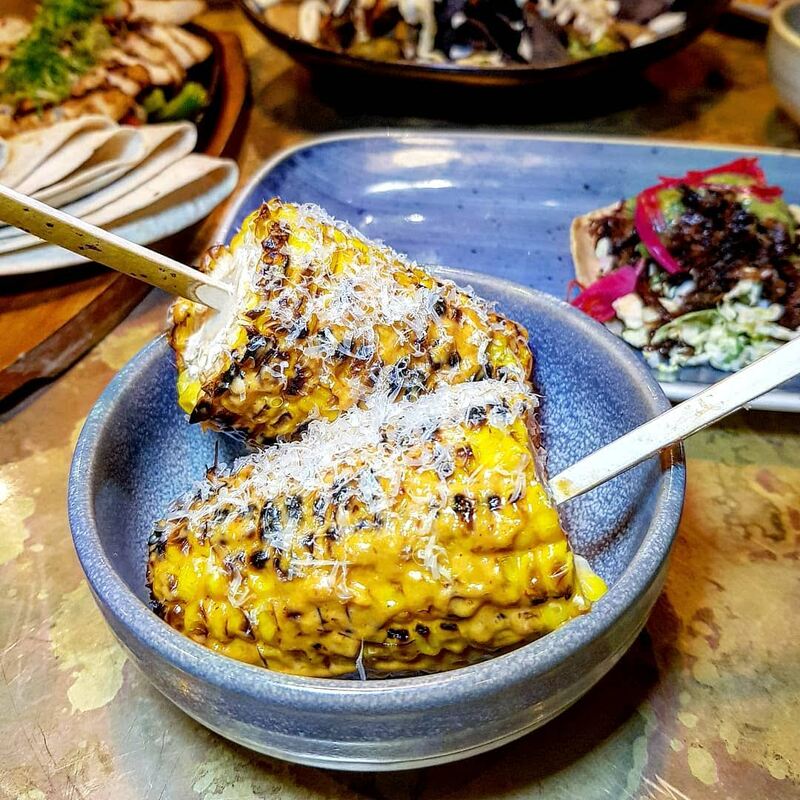 I’m a huge corn fan, and I now want all corn to be served like this! If that isn’t enough, there’s one dessert option. But you only need one when it’s Churros coated in cinnamon sugar right?! 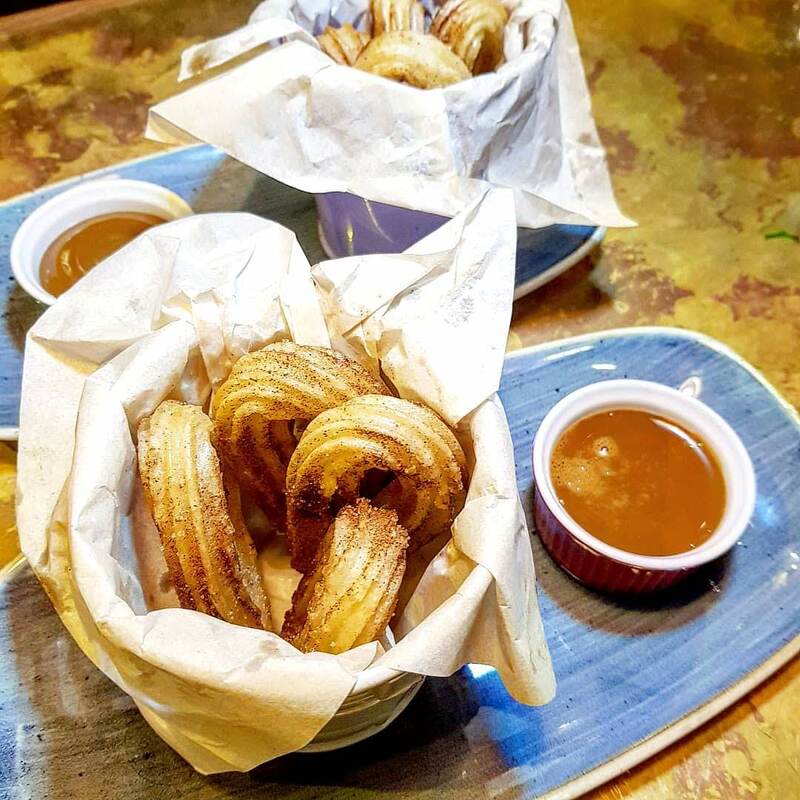 Nicola (East London Girl) doesn’t even usually like churros, and she couldn’t get enough of these. That’s how good they were. Warm, sugary with a slight cinnamon flavour shining through. They were slightly crisp and beautifully dough-y inside. Mmmm I’m drooling just thinking about them. The Dulce de Leche was fab – a sweet, caramel style sauce. But the Dulce de Leche with Patron XO Cafe was even better. The coffee flavour coming through just a bit. Pepitos has a handful of tequila classic cocktails and specials, wine, as well as a few beers and juices. 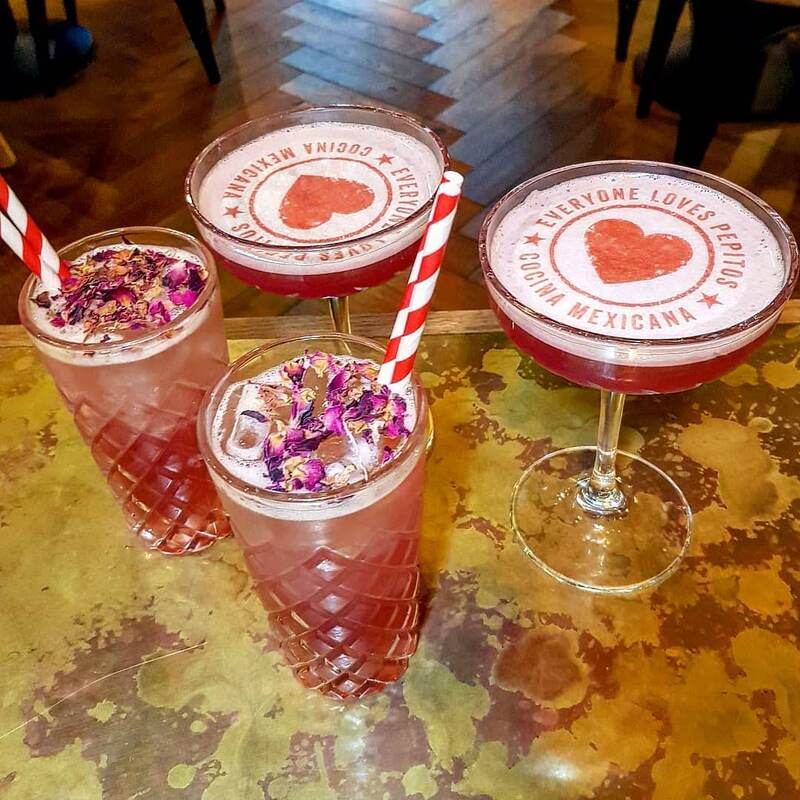 The Mexican Heart, with Gin, Agave, Rosewater, Pomegranate, didn’t just look pretty – it’s totally instagrammable right?!. 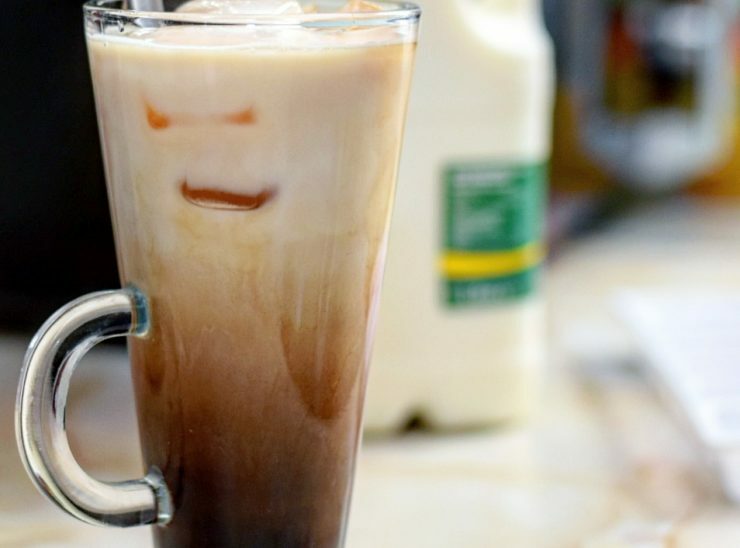 It was sweet, delicious and very easy-drinking. A great option for a gin lover. The Azul Corazon, with Tequila, Aperol, Egg White, Blueberry was another delicious option. We also tried a whiskey special, which even as not a whiskey fan, I really enjoyed! Such a feast and a lovely evening double dating – it’s quite a quiet spot, so it was a great place for a catch-up! 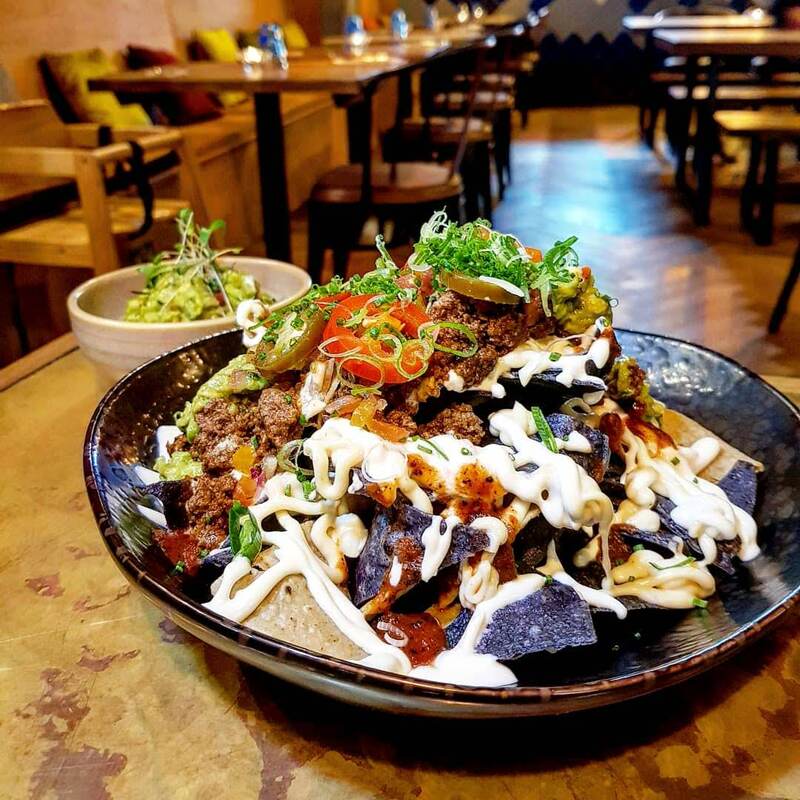 Price: Affordable – tacos were between £6.95 and £7.50 for three, enchiladas were £11.50 and the supreme beef nachos were £8.50. Cocktails were between £9 and £11. Food: Fresh, delicious flavours and textures. 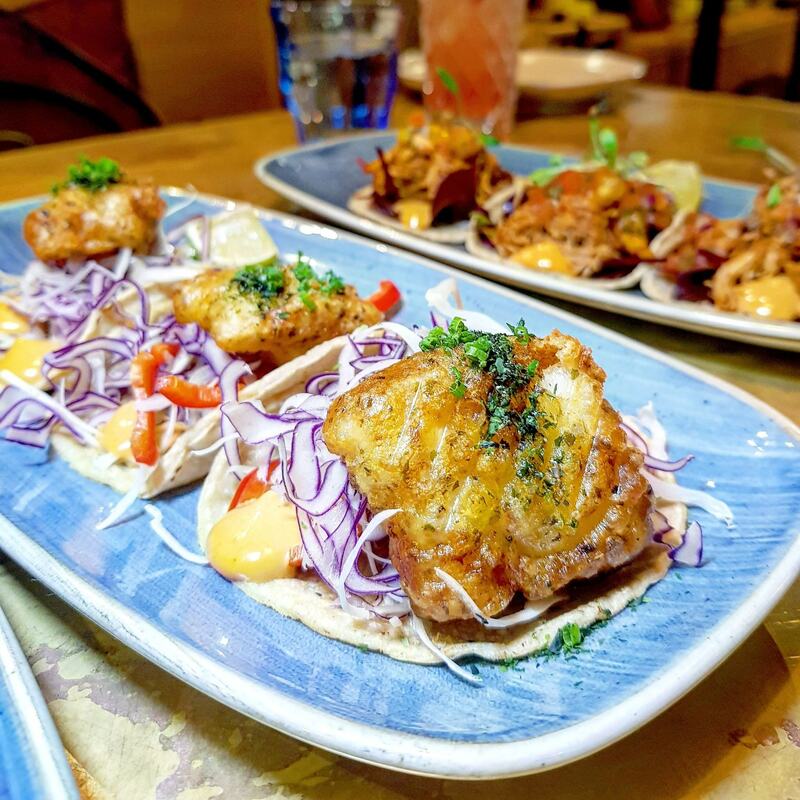 They’re trying to incorporate more fusion dishes, but the fish tacos and beef nachos are a must! Wait: It was super quiet on the Tuesday we visited, but we can see it becoming a popular spot for sure! What would you have ordered? Do you venture to hackney much? *This was a complimentary meal, dining with East London Girl. All views my own.